Editor’s Note: Umm..yes, we know this isn’t in Argentina. But it’s close to the Lake District. Remember those days at summer camp where you stepped onto campus and the biggest problem was trying to decide what activity to do first? That is exactly the sensation I got when I first arrived at Aguas Calientes in Puyehue Chile. 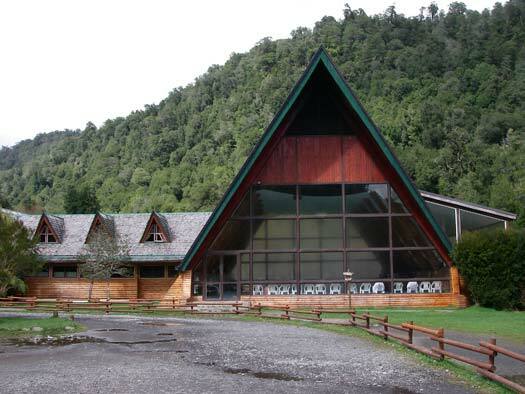 Right across the border in the lake district of Patagonia this community has been formed for the travelers looking for a way to get into nature, experience a fun and friendly atmosphere with an endless number of activities, and of course relax in the soothing hot springs. From the passenger seat of our rental car I followed the map and my nose down the forested dirt roads in Chile until we arrived at this charming village. From the front desk we were shown our cabin, the restaurant, a little café, a small shop where we could buy a limited number of snacks, a playground for children, a volleyball court, a museum of the area, the hot springs, and much more. Lodging there is made up of a series of A-frame cabins that are clean, cozy, and have plenty of room for a party full of people, I couldn’t wait to step inside our little cabin and throw my things around to make it feel like home. The place was perfect. Four of us split the cabin but there was room enough for ten, or even more. The cabin we stayed in had one main bedroom on the bottom floor with a bed big enough for two and an upstairs loft with eight twin beds, one bathroom for all to share, a kitchen for cooking purposes, and a little living area with a table, couch and even a small television. It was getting late when we arrived so we decided to save the exploring for the morning and cooked up a big feast with the groceries we purchased in town before arriving. (Highly recommended if you plan on cooking). The next morning the hot springs were calling and we realized we had three options when going for a dip: the indoor pool where one can find the majority of the elderly people soaking away, the outdoor pool that sits along side the river in a big concrete slab, and the natural pools that the individual soakers form by maneuvering small river rocks into a circle until they have created the perfect temperature. The price of entering the hot springs was included in the price of staying in the village so we made sure to test out the waters of each one. The small pools along side the river were definitely the most private and exciting for those with an adventurous spirit but if it is comfort and ease that you are looking for, the outdoor pool may be more your style. Eventually our pruned bodies needed a break from the water and we decided to get a little exercise hiking along a nearby mountain trail that leads to a look out spot over the area. 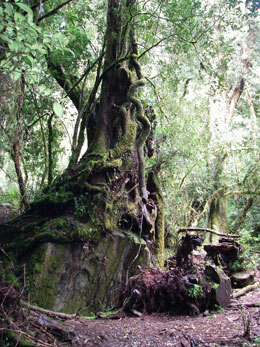 The history of this temperate rain forest is evident with the giant trees that tower above and weave in and out of one another. The green moss that grows on the south side of every tree and branch reminds you that you are in the southern hemisphere and there is foliage as far as the eye can see. It took us about an hour to get to the look out, and once there it took us another until we decided to leave. Between the spectacular views and the wonderful company we had with a sweet Chilean couple we met at the top, we decided to stick around for a bit longer. The views were incredible but we knew there was one other way of seeing the forest that we had not yet experienced so we headed back down the trail. Aguas Calienties also offers a canopying service with two expert men who help get you all strapped up and prepare you for a high flying trip. 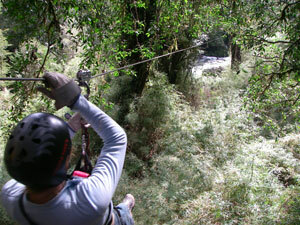 At the tops of the trees are a series of platforms connected with long cables stretching over the beautiful forests and rivers below. Here you get a different perspective on the massive size of the trees; and once again I felt that contagious camp-like atmosphere overwhelm me as I zipped from tree to tree with the wind in my hair. We wrapped up our adventure in Aguas Calienties with a dinner in the restaurant and an exciting game of BINGO. Each night the community hosts a different event for all of the guests and we enthusiastically joined the crowds in the café. 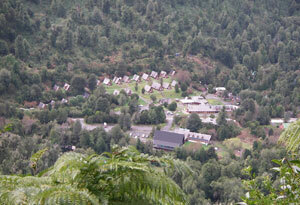 It was a great night, a great weekend, and made for some wonderful memories in this Chilean hot springs village. The location of Aguas Calientes is fairly isolated and is not a main stop along the South American bus lines; however, if you have an opportunity to spend a day or two in this community, you shouldn’t pass it up. How did you like the hot springs at Agua Caliente? Which pools did you like the best? Were the natural pools hot and deep enough and were they pretty clean. We are going there tomorrow and any advice would be helpful. Thanks! This page rendered in 0.07 seconds.